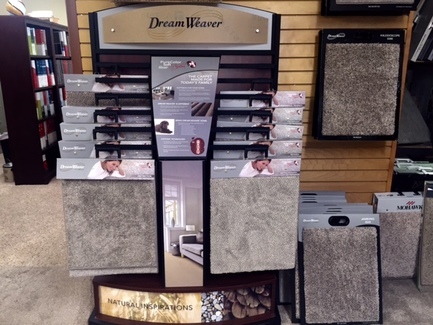 Dream Weaver Carpet at The Carpet Gallery Inc.
Click the picture to learn more about Dream Weaver products. Thank you for your interest in Dream Weaver products. Dream Weaver is committed to providing customers with first-class products with exceptional value. All carpet by Dream Weaver feature PureColor™ solution dyed polyester fiber. PureColor™ polyester is one of the most innovative and sought after fiber systems on the market today. It features superior stain and fade resistance, is impervious to harsh chemicals— including household bleach—and has a soft and luxurious feel that you and your family will love. PureColor™ products carry a limited lifetime stain warranty. All Dream Weaver products also feature SoilShield™, which helps block soil from adhering to the fibers of your carpet. This keeps your carpet looking like new, longer.